USS Muliphen (AKA-61/LKA-61) was an Andromeda class attack cargo ship named after Muliphen, a star in the constellation Canis Major. 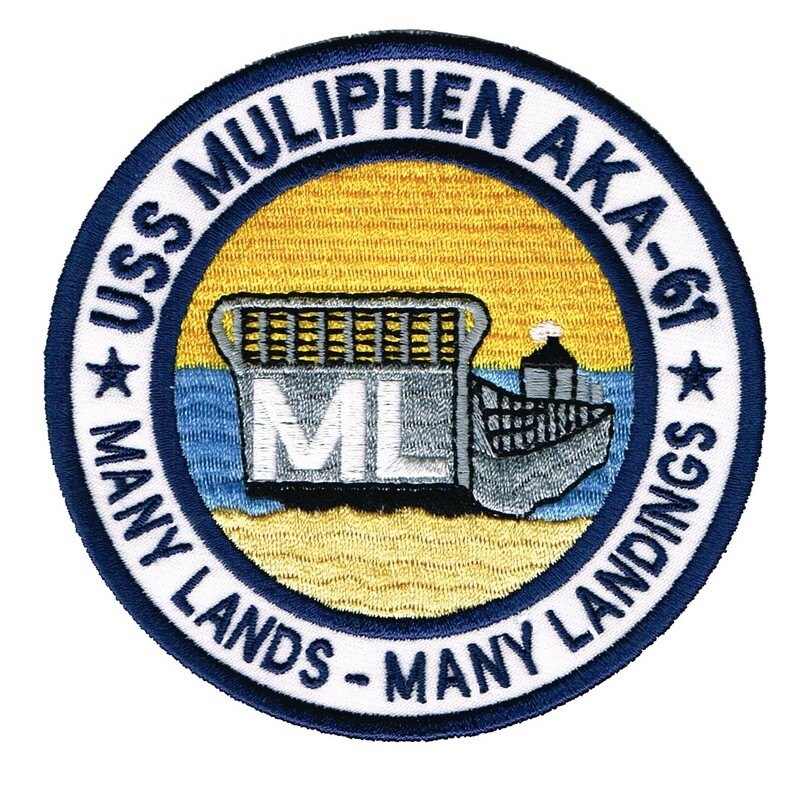 Muliphen (AKA–61) was laid down under Maritime Commission contract 13 May 1944 by Federal Shipbuilding and Drydock Co., Kearny, N.J.; launched 26 August 1944; sponsored by Mrs. John Hascock; acquired by the Navy 21 October 1944; and commissioned 23 October 1944, Lt. Comdr. Walter W. Williamson in command. Following shakedown in Chesapeake Bay, Muliphen sailed 1 December 1944 to operate with the Key West, Fla., Sound School. On 14 December, she steamed for the Pacific where she joined Transport Division 43 off Pearl Harbor, and sailed to prepare for the invasion of Iwo Jima at Eniwetok, arriving 5 February 1945. Muliphen arrived off Iwo Jima 19 February, unloaded until 4 March, then retired to Saipan. She departed 27 March for the invasion of Okinawa, took part in a feint landing 1 April, and repeated the feint the following day. Held in reserve off Okinawa until 10 April, she sailed then for Saipan and cargo duty between the Marianas and Solomons. She arrived Manila 18 September with a cargo of underwater demolition gear, and spent the next 3 months carrying occupation troops to Japan from the Philippines, until sailing for Seattle 24 November. Serving with the Naval Transportation Service, for the next 4 years she carried men and supplies to Asiatic and Pacific ports, and supplied Point Barrow, Alaska in 1946 and 1947. In 1950 Muliphen transferred to the Atlantic Fleet Amphibious Amphibious Force, based at Norfolk. The following decade she rotated in a steady schedule of Caribbean and Mediterranean deployments. She participated in the amphibious landings at Beirut, Lebanon, when a prompt response by the 6th Fleet prevented Communist subversion of Lebanon’s government. Continuing similar duty in the 1960’s, she also took part in NATO exercises and the training of Naval Academy midshipmen. On 1 January 1969, Muliphen was redesignated LKA-61. Muliphen was struck from the Naval Register on January 1, 1977. On January 20, 1989 she was sunk off the coast of Stuart, Florida as an artificial reef. Muliphen received two battle stars for World War II service. This article includes text from the public domain Dictionary of American Naval Fighting Ships. This page was last modified 20:40, 13 August 2007.